Android app permissions can be daunting and somewhat terrifying when you look at them. It can leave us wondering why does a calculator app need access to my microphone or contacts list. I hope that this post can put your mind at ease when installing a new app from the Play Store. There is a legitimate reason that apps need access to certain hardware and list items of your device let’s break it down. Some apps can push data directly to your SMS messages (eg. Inserting a link), without this functionality, it could make some apps far less useful. Perhaps you’d like to take a picture and push it straight into the app? Instagram, Hangouts and many other popular apps need this permission. Apps can traverse through your contacts and see others that have that app installed and allow you to communicate with them. (eg. Snapchat). This will allow you to communicate with people that you know, just in a different way. Saving things to your device can be vital, this doesn’t mean that the app will read all of the contents of your ROM (if it did you’d know because it would be accessing it for some time). If the app uses data for any type of transfer (eg. Loading lists, pictures, sending items, etc) the app will need to use your mobile or Wi-fi data. In some cases you may want to export an event to your calendar. In the example above you notice that Facebook utilizes this. No, your phone is not listening to you all the time. But I bet you like dictating text messages instead of tapping away while driving. Or you like to be able to do voice conferences with video. In conclusion, although we ask ourselves why does an app need so many permissions when they utilize them to the fullest and make the app just work. In the upcoming Android 6.0 (Marshmallow) release users will be able to restrict certain permissions so if you don’t want your text message app using your microphone, disable it. Just don’t expect to dictate a message until you turn it back on! Apps need permissions and all apps are not out to get you, especially ones that are available in the Play Store. Stay safe and watch apks that are downloaded from untrusted sources — those could harm your device; however, when it is obtained from a safe source, the app will work as designed and use the permissions as needed. 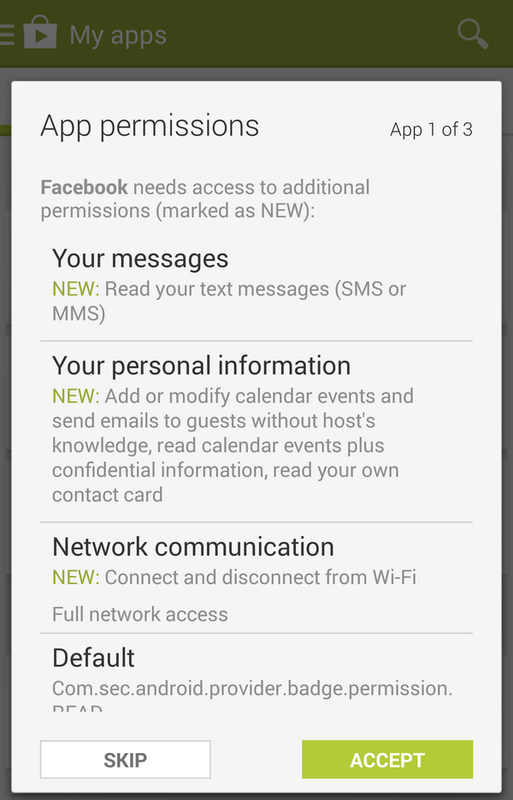 Bottom line: Don’t freak out about this stuff, your apps need these permissions to work the way they do. Removing them will only hamper your experience. Previous Previous post: iOS and Android Differences, Flaws and Overview.